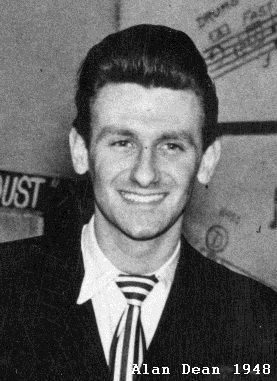 Born in 1924, Alan Dean was a vocalist and typical figure of the immediate post war band era, working with the premier bands, big and small, along the way forming the Song Pedlars vocal group. He later updated the vocal group concept by forming the Keynotes, Alan personally winning the Melody Maker poll two years running. He had a light toned ballad voice but he was also a bopper and in this context composed some fast moving but melodic bop lines notably Galaxy and First Gear using his voice as an additional horn, plus some scatting. He was the nominal leader of the All Star Sextet which made it's debut at the Downbeat Club on March 14th, 1948. The declared intention of the Sextet was to play only bebop and it was probably the first UK bebop-orientated group to play the clubs, they certainly played enough to qualify as a regular group. Aubrey Frank, Alan Dean, Reg Arnold and Norman Burns. Ralph Sharon, Tommy Pollard and Jack Fallon. There were three genuine 'boppers' (Dean, Sharon and Pollard) in the group. The others were big band or night club musicians seeking relief from their bread and butter work and keen to learn the new bebop. The group was popular at the Feldman Swing Club and also got to broadcast for the BBC Overeas Service. Esquire recorded the band very early in it's life, the outstanding soloists on these 1948 titles were Ralph Sharon and Tommy Pollard. This was the only time that Pollard was recorded playing vibes and his superb playing stands above everything else to be heard, his feature on I Can't Get Started is a masterpiece. The music recorded on these two sessions is arguably the first overtly British bebop group to be heard on record. The 'Beboppers' recordings for Decca were the first bebop records issued by a major record company. Later in the year the 'Beboppers' repeated most of the titles over the air but the recording was not issued for nearly 40 years. The personnel was the same except that boppers Hank Shaw and Tommy Pollard replaced Reg Arnold and Bernie Fenton. Alan Dean emigrated to America in September, 1951 and began a successful career. By the 1980s he was resident in Australia.